Teaching English as a second language (ESL) abroad is no longer a linear endeavor for travel or a gap year; it is now a legitimate career option. 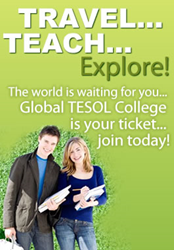 Whether a young college graduate or a recently retired adult, earning a TESOL certificate (Teach English to Speakers of Other Languages) now provides a pathway to finding lucrative and expansive careers in the teaching field, while still offering exciting gateways to travel and live in exotic environments. Costa Rica, located in the heart of the emerging Central American ESL market, is an increasingly popular destination to both obtain a teaching certification and teach professionally. Known for its peaceful population, inviting culture, and stunning rainforests and beaches, it's little wonder why many ESL (English as a Second Language) teachers flock to the tropical country every year as a launching pad for their careers. Helping to pave the way, Costa Rica is home to Global TESOL College, one of the world's leading institutions for earning an accredited teaching certificate. The institute recently announced a lucrative partnership with the country’s Amistad Institute, a Spanish immersion and volunteer organization, which will expand the TESOL student experience outside the classroom for those looking to go beyond simply learning the trade. “Many of the students in our month-long program crave a deeper connection with the Costa Rican culture,” said Global TESOL College Costa Rica owner Andre Sigourney. “They are looking to not only earn a teaching certificate, but to learn Spanish and make a positive impact on the community." Speaking by phone, Mr. Sigourney echoed the school’s excitement over the agreement. "We're very proud to have partnered with the very reputable and established Spanish immersion and volunteer program the Amistad Institute offers." For their part, the Amistad Institute hosts students from around the world who travel to Costa Rica to study Spanish and to volunteer. "We have been very successful over the years with our full-service programs and housing in Heredia. Now we have a new, second location at the beach in the Central Pacific town of Jacó," Amistad Institute director, Marco Bolaños, said. "Having partnered with Global TESOL College, we are able to offer what many students have always desired: volunteering, Spanish emersion, and accreditation to teach English that is recognized worldwide. These are real life skills that our graduates can take with them forever." While the in-course portion of Global TESOL College’s program can be demanding, the new partnership allows for the perfect work-life balance in an ideal beach setting, says the institute’s lead instructor, Elizabeth Farrar. "The programs are very intense, and incredibly rewarding," she confirmed. "Students are working extremely hard during the week with their TESOL studies, Spanish classes, and volunteer work. When the weekend arrives, it's all about enjoying the beach and the wonderful activities Costa Rica has to offer. It's a truly holistic and unforgettable experience." The packages the college offers take everything into account. With airport pickup, housing, cultural training, room and board, and an exhaustive course curriculum, students from all over the world are warmly welcomed and well taken care of. A variety of trips and excursions are offered at significant discounts, and the chance to safely enjoy the great natural parks, beaches, and everything Costa Rica has to offer is always strongly encouraged. Global TESOL College also offers monthly informational webinars free of charge for prospective students, and the institute encourages anyone interested in learning more about available programs to attend. All webinars offer the opportunity to simply observe FAQ sessions, or to interact and speak directly with instructors and directors to efforts to ease the transition of moving abroad. To receive information about the webinars, email info(at)globaltesolcostarica(dot)com and receive an invitation to the free sessions.